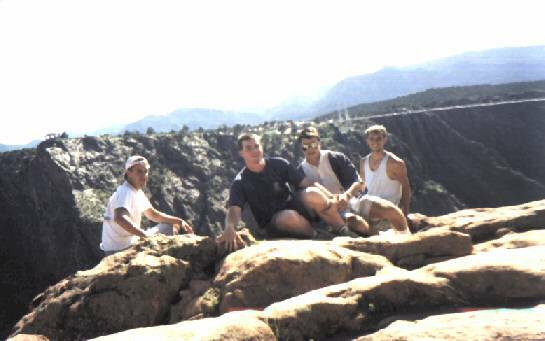 Then we drove to the canyon (Royal Gorge) ... HUGE, DEEP... quite impressive. 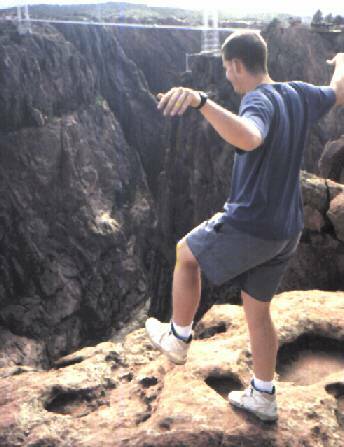 We took some pictures and I was coerced into jumping off a small shelf to make it look like I jumped into the canyon. Well, it was about 6 feet down onto rock and I hurt my foot, but not too badly. We also saw "award winning Indian dancing for ya." Then we went and found a cool campsite in Garfield, CO... free too. We built a big fire and cooked hamburgers, Mmm good. We ate potatoes too... so we don't get scurvy, said rosary around the fire and went to bed.